1. Put the fish into a shallow pan and pour the milk over. Bring to a simmer and poach for 3–5 minutes until just cooked. Remove the fish, set aside and reserve the poaching milk. 2. In another pan, melt 50g butter, stir in the flour and cook for a minute. Remove from the heat, then gradually mix in the poaching milk, a little at a time, beating with a wooden spoon after each addition. Bring to the boil, stirring. Season, lower the heat and cook for 2 minutes. Add the cream and parsley. Simmer for a minute. 3. Put the fish and prawns into a 2-litre pie dish. Add any milky liquid under the fish to the sauce, then pour over the fish and mix it through. 4. Meanwhile, melt the remaining butter in a saucepan and add the leeks. Turn until coated in butter. Season, add a couple of tablespoons of water, cover with a lid and sweat over a low heat until really soft. 5. Preheat the oven to 200°C, gas mark 6. 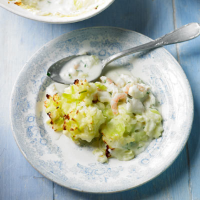 Cook the potatoes until tender, then drain thoroughly and mash, adding the leeks and buttery juices. Season well. Top the pie with the mash. Bake the pie for 30 minutes until golden and piping hot. A classic Bechamel or white sauce is the base for many dishes. The key to getting it right is to mix equal quantities of melted butter and flour together, cook for a minute, then gradually add milk making sure the mixture is smooth. Add more milk, return to the heat and stir until the sauce simmers and has thickened.